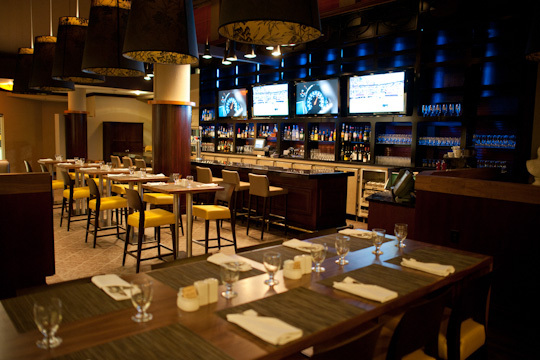 Aperitivo is a small, yet intimate Globally inspired restaurant that is located in the heart of Kanata Centrum Walk. The restaurant concentrates on serving small plates (tapas) designed to be shared. Boasting a great selection of wines, spirits, and coctails alongside a fantastic menu filled with locally-sourced meats and produce, Aperitivo truly is in a class of its own. Graffiti’s Italian Eatery is the ideal choice for a casual fine dining experience in Kanata. Come in for breakfast, lunch or dinner and enjoy modern Italian cuisine, complemented with locally-grown fresh ingredients. Graffiti’s is perfect for special occasions, catching up with friends, or getting together and winding down with colleagues. You’re only seconds away from a delicious meal when staying at the Holiday Inn Kanata or after enjoying an event at Scotiabank Place. Drop by Graffiti’s for a taste of Venice that is slightly closer to home. Options Jazz Lounge is found in Brookstreet Hotel and meshes perfectly with the boutique hotel’s classy ambiance. A cosmopolitan interior, boasting thought-provoking architecture, is juxtaposed with bright windows offering panoramic views of the spacious patio and adjoining Marshes Gold Course. Enjoy a menu featuring contemporary sushi and other mouth-watering culinary creations, while swaying to the sounds of live jazz, playing seven nights a week..